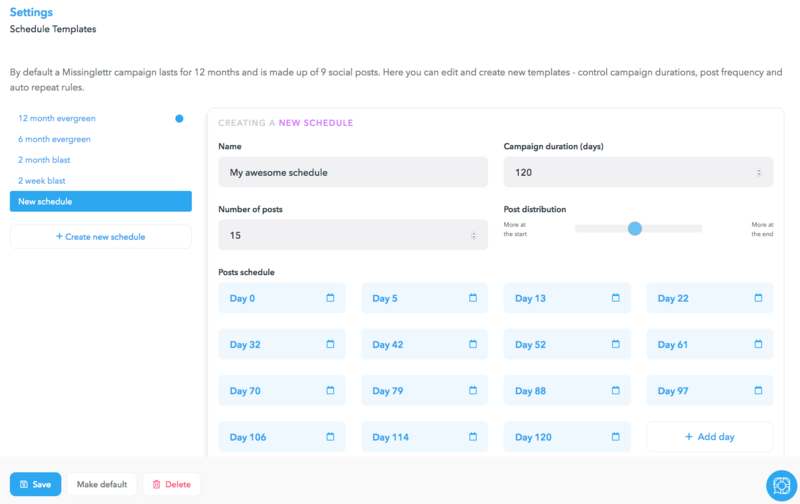 Schedule templates allow users to choose between availale campaign layouts or create their own. 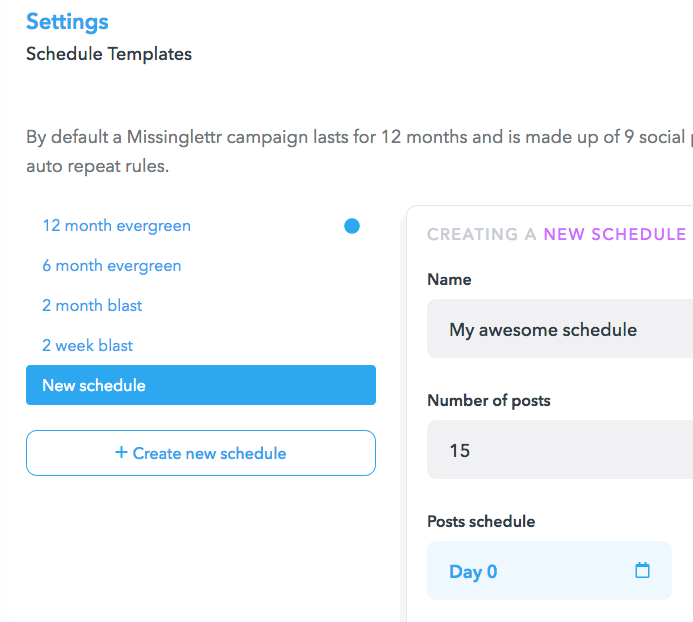 With schedule templates, you can create campaigns that last for a few days or up to 2 years. Using, editing existing and creating your own schedule templates is available to users on the Business and Team plans. To create a new schedule template click the "+ Create new schedule" under the offered schedule templates. You are free to fine-tune a schedule template to your exact needs. Just make sure that the Campaign duration is longer than the number of posts. A campaign can run for a maximum of 2 years - 730 days and have up to 50 posts per social profile connected. 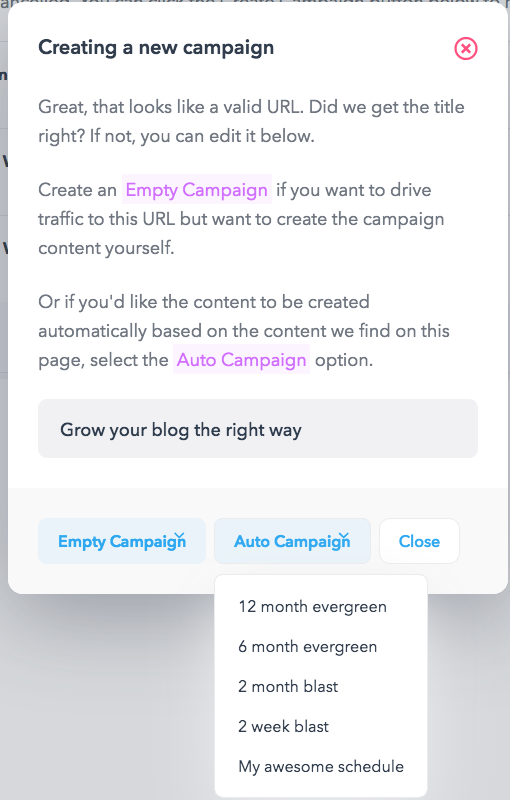 The post distribution slider allows you to concentrate more posts at the beginning/end of the campaign or keep the post evenly balanced. The bottom section allows you to change/remove the posting days and add new ones. Once you are done customizing use the "Save" button at the bottom of the page. You can make any schedule template the default one using the "Make default" button. 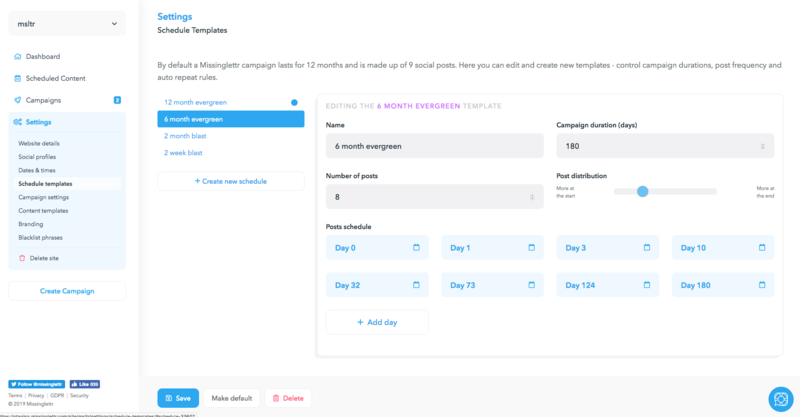 When ever you create or regenerate a campaign, you can choose which schedule template you would like to use. Any updates made to schedule templates are applied to any campaign created from that moment on. Applying changes to a created campaigns require campaign regeneration.